George was born in Stonnall to Samuel and Margaret of Brownhills Road, Walsall Wood, his father being a coal miner. He was married to Rose Harley at Walsall in 1911 and resided at Brownhills Road, Walsall Wood with her and their two children. George enlisted in the Army at Nuneaton on Tuesday 01/09/1914, at which time he was employed at the Harley Colliery in that area, and was drafted to France on Friday 13/08/1915. He was killed during normal trench warfare in trenches south east of Arras. United kingdom Lance Corporal 22906 The King's (Liverpool Regiment) 18/03/1917 G. 6. United kingdom Private 21219 Duke of Cornwall's Light Infantry 03/03/1916 B. 7. United kingdom Private 10122 Royal Scots Fusiliers 03/04/1917 G. 31. United kingdom Private 513178 London Regiment (London Scottish) 28/03/1917 Age: 36 G. 15. United kingdom Private 23399 Wiltshire Regiment 18/02/1917 Age: 23 F. 15. United kingdom Private 26855 Wiltshire Regiment 11/03/1917 E. 4. United kingdom Rifleman R/8485 King's Royal Rifle Corps 29/01/1917 Age: 19 F. 17. United kingdom Private 241787 Middlesex Regiment 01/04/1917 Age: 30 G. 29. United kingdom Private 31391 Northumberland Fusiliers 29/04/1917 C. 45. United kingdom Private 11623 Duke of Cornwall's Light Infantry 16/06/1916 Age: 29 C. 29. United kingdom Rifleman B/1091 Rifle Brigade 10/05/1916 C. 17. United kingdom Private 26780 Suffolk Regiment 28/08/1916 Age: 32 F. 47. United kingdom Private 32533 Oxford and Bucks Light Infantry 25/10/1916 Age: 28 E. 28. United kingdom Gunner 113970 Royal Garrison Artillery 29/03/1917 Age: 22 G. 22. United kingdom Rifleman 8759 London Regiment (Queen's Westminster Rifles) 08/04/1917 Age: 22 G. 57. United kingdom Private 20086 Machine Gun Corps (Infantry) 14/05/1916 C. 19. United kingdom Private 15943 Somerset Light Infantry 26/01/1917 E. 21. United kingdom Rifleman B/1698 Rifle Brigade 09/05/1916 C. 15. United kingdom Bombardier 5495 Royal Garrison Artillery 16/05/1916 B. 15. United kingdom Private 23087 King's Own Yorkshire Light Infantry 12/10/1916 Age: 33 E. 33. United kingdom Private G/17671 Royal Sussex Regiment 26/09/1916 F. 48. United kingdom Gunner 84932 Royal Field Artillery 03/06/1916 Age: 19 B. 26. United kingdom Private 43051 Suffolk Regiment 12/09/1916 Age: 38 F. 44. United kingdom Second Lieutenant Durham Light Infantry 14/04/1917 Age: 28 H. 44/57. United kingdom Lance Corporal 4709 The King's (Liverpool Regiment) 14/07/1916 Age: 23 D. 12. United kingdom Private G/1755 Royal Fusiliers 11/09/1916 Age: 38 E. 38. United kingdom Lance Corporal 17533 York and Lancaster Regiment 20/07/1916 D. 17. United kingdom Second Lieutenant London Regiment (Queen's Westminster Rifles) 08/04/1917 G. 48. United kingdom Serjeant 11632 King's Own Yorkshire Light Infantry 30/05/1916 Age: 22 B. 22. United kingdom Lance Corporal 7484 Durham Light Infantry 13/04/1917 Age: 24 H. 44/57. United kingdom Private 17560 Somerset Light Infantry 16/10/1916 F. 37. United kingdom Private 27275 Somerset Light Infantry 06/01/1917 F. 50. United kingdom Rifleman 3146 Rifle Brigade 31/05/1916 B. 25. United kingdom Captain The King's (Liverpool Regiment) 22/02/1917 Age: 28 E. 16. United kingdom Private 24708 Oxford and Bucks Light Infantry 17/01/1917 E. 25. United kingdom Rifleman B/200738 Rifle Brigade 10/03/1917 Age: 19 E. 8. United kingdom Private 16788 Yorkshire Regiment 30/07/1916 C. 35. United kingdom Corporal 24/904 Northumberland Fusiliers 28/04/1917 Age: 26 B. 38. United kingdom Second Lieutenant Machine Gun Corps (Infantry) 13/12/1916 F. 24. United kingdom Private 15987 Oxford and Bucks Light Infantry 08/07/1916 Age: 21 D. 34. 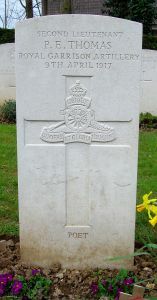 United kingdom Private 295598 London Regiment (Royal Fusiliers) 09/04/1918 Age: 24 H. 4. United kingdom Lance Corporal 12261 West Yorkshire Regiment (Prince of Wales's Own) 16/08/1916 Age: 22 E. 35. United kingdom Private 43220 Suffolk Regiment 28/08/1916 Age: 25 E. 43. United kingdom Lance Corporal 510712 London Regiment (London Scottish) 28/03/1917 Age: 21 G. 16. United kingdom Second Lieutenant London Regiment (Royal Fusiliers) 02/04/1917 Age: 23 G. 33. United kingdom Rifleman 7388 London Regiment (Queen's Westminster Rifles) 08/04/1917 Age: 35 G. 59. United kingdom Corporal S/12737 Rifle Brigade 11/05/1916 B. 13. United kingdom Serjeant 25911 Machine Gun Corps (Infantry) 03/04/1917 G. 37. United kingdom Private 10771 King's Own Yorkshire Light Infantry 07/06/1916 B. 24. United kingdom Private 17398 Duke of Wellington's (West Riding Regiment) 04/08/1916 Age: 22 D. 26. United kingdom Corporal A/3053 King's Royal Rifle Corps 02/06/1916 C. 27. United kingdom Private 513505 London Regiment (London Scottish) 28/03/1917 Age: 33 G. 14. United kingdom Private 23275 Duke of Cornwall's Light Infantry 03/03/1916 Age: 25 B. 5. United kingdom Driver T/34560 Army Service Corps 24/05/1917 Age: 23 B. 34. United kingdom Gunner 123792 Royal Field Artillery 04/04/1917 G. 43. United kingdom Driver 173475 Royal Engineers 08/04/1917 D. 38. United kingdom Gunner 27463 Royal Field Artillery 24/02/1917 Age: 24 F. 6. United kingdom Rifleman 7607 London Regiment (Queen's Westminster Rifles) 08/04/1917 Age: 22 G. 62. United kingdom Private 9989 Durham Light Infantry 30/05/1916 Age: 19 C. 26. United kingdom Gunner 47263 Royal Garrison Artillery 05/04/1917 Age: 29 G. 39. United kingdom Private 27507 Somerset Light Infantry 26/01/1917 Age: 28 E. 19. United kingdom Private 42676 The Queen's (Royal West Surrey Regiment) 01/05/1917 Age: 41 H. 61. United kingdom Private G/76082 London Regiment (Royal Fusiliers) 09/04/1918 Age: 19 H. 3. United kingdom Private 12811 Durham Light Infantry 27/05/1916 Age: 37 C. 22. United kingdom Private 325823 Durham Light Infantry 13/04/1917 H. 44/57. United kingdom Private 25446 King's Own Yorkshire Light Infantry 31/05/1916 Age: 40 C. 24. United kingdom Private 26600 Suffolk Regiment 28/08/1916 E. 42. United kingdom Private 4954 The King's (Liverpool Regiment) 08/07/1916 Age: 33 D. 8. United kingdom Private 11695 Duke of Wellington's (West Riding Regiment) 11/08/1916 D. 37. United kingdom Second Lieutenant The Buffs (East Kent Regiment) 10/04/1917 H. 1. United kingdom Private 4681 The King's (Liverpool Regiment) 07/07/1916 Age: 20 D. 6. United kingdom Private 26220 King's Shropshire Light Infantry 06/01/1917 Age: 22 F. 21. United kingdom Rifleman 1972 Rifle Brigade 09/05/1916 Age: 28 C. 13. United kingdom Rifleman Y/1254 King's Royal Rifle Corps 27/06/1916 C. 37. United kingdom Corporal 200370 Middlesex Regiment 28/03/1917 Age: 20 G. 10. United kingdom Private 3345 London Regiment (Royal Fusiliers) 30/03/1917 G. 25. United kingdom Private 17824 King's Shropshire Light Infantry 15/07/1916 Age: 21 D. 32. United kingdom Lance Corporal M2/265634 Army Service Corps 08/05/1917 Age: 33 E. 47. United kingdom Private 19220 South Staffordshire Regiment 24/07/1916 Age: 19 D. 25. United kingdom Lance Corporal R/8471 King's Royal Rifle Corps 06/05/1916 Age: 21 C. 10. United kingdom Private 20299 Machine Gun Corps (Infantry) 13/12/1916 Age: 24 F. 23. United kingdom Private 23605 King's Own Yorkshire Light Infantry 12/10/1916 Age: 20 E. 29. United kingdom Serjeant 200930 Middlesex Regiment 28/03/1917 Age: 28 G. 11. United kingdom Private 12537 The King's (Liverpool Regiment) 25/01/1917 E. 24. United kingdom Private 21965 Duke of Cornwall's Light Infantry 16/03/1916 B. 4. United kingdom Second Lieutenant Durham Light Infantry 02/04/1916 Age: 25 C. 7. United kingdom Private 22059 The King's (Liverpool Regiment) 18/03/1917 G. 7. United kingdom Rifleman 393540 London Regiment (Queen Victoria's Rifles) 11/04/1917 Age: 36 H. 63. United kingdom Serjeant S/7753 Royal Fusiliers 27/08/1916 E. 36. United kingdom Private 18712 Yorkshire Regiment 26/07/1916 Age: 37 D. 22. United kingdom Corporal 16566 The King's (Liverpool Regiment) 15/03/1917 Age: 28 D. 1. United kingdom Private 1421 London Regiment (Royal Fusiliers) 31/03/1917 G. 27. United kingdom Private 325565 Durham Light Infantry 13/04/1917 Age: 20 H. 44/57. United kingdom Private 282966 London Regiment (Royal Fusiliers) 31/03/1917 G. 28. United kingdom Rifleman 3535 South Lancashire Regiment 16/07/1916 Age: 20 D. 13. United kingdom Private 235200 Duke of Wellington's (West Riding Regiment) 03/05/1917 A. 2. United kingdom Private 18096 King's Own Yorkshire Light Infantry 28/05/1916 C. 23. United kingdom Corporal 3446 Rifle Brigade 09/05/1916 Age: 25 C. 16. United kingdom Second Lieutenant Royal Fusiliers 27/08/1916 Age: 28 E. 37. United kingdom Rifleman 5919 London Regiment (Queen's Westminster Rifles) 08/04/1917 Age: 34 G. 51. 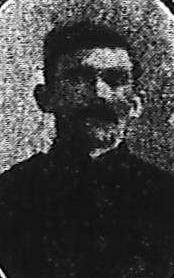 United kingdom Lance Corporal 19042 Oxford and Bucks Light Infantry 12/07/1916 Age: 38 D. 33. United kingdom Lance Corporal 1782 Middlesex Regiment 21/08/1916 Age: 19 E. 34. United kingdom Second Lieutenant Northamptonshire Regiment 20/03/1917 Age: 20 F. 3. United kingdom Pioneer 128412 Royal Engineers 12/11/1916 Age: 22 F. 36. United kingdom Lance Corporal 17603 York and Lancaster Regiment 21/07/1916 D. 18. United kingdom Rifleman R/24235 King's Royal Rifle Corps 29/09/1916 Age: 25 E. 30. United kingdom Private 18695 King's Shropshire Light Infantry 15/07/1916 Age: 27 D. 32. United kingdom Battery Serjeant Major 24280 Royal Garrison Artillery 31/03/1917 Age: 28 G. 26. United kingdom Private 325638 Durham Light Infantry 13/04/1917 H. 44/57. United kingdom Private DM2/224755 Army Service Corps 08/04/1917 Age: 38 E. 48. United kingdom Rifleman 7028 London Regiment (Queen's Westminster Rifles) 08/04/1917 G. 60. United kingdom Second Lieutenant Durham Light Infantry 13/04/1917 Age: 25 H. 44/57. United kingdom Lance Corporal 15409 The King's (Liverpool Regiment) 06/03/1917 Age: 24 F. 8. United kingdom Gunner 122240 Royal Garrison Artillery 18/02/1917 Age: 26 F. 13. United kingdom Private 4706 London Regiment (Royal Fusiliers) 02/04/1917 G. 32. United kingdom Rifleman 12058 King's Royal Rifle Corps 05/05/1916 C. 9. United kingdom Sapper 548533 Royal Engineers 08/04/1917 G. 47. 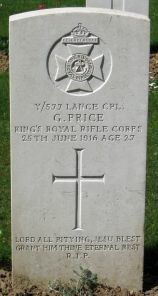 United kingdom Private 19842 West Yorkshire Regiment (Prince of Wales's Own) 05/08/1916 Age: 20 D. 30. United kingdom Private 58698 The King's (Liverpool Regiment) 06/03/1917 Age: 25 F. 9. United kingdom Private 3954 King's Own (Royal Lancaster Regiment) 14/07/1916 D. 10. United kingdom Rifleman 7125 London Regiment (Queen's Westminster Rifles) 08/04/1917 Age: 21 G. 49. United kingdom Private SD/5339 Royal Sussex Regiment 14/11/1916 F. 43. United kingdom Private 17660 York and Lancaster Regiment 21/07/1916 Age: 24 D. 18. United kingdom Private PS/10549 Royal Fusiliers 01/09/1916 Age: 20 E. 41. 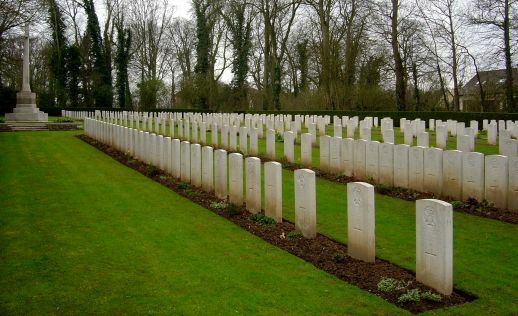 United kingdom Private G/22810 The Queen's (Royal West Surrey Regiment) 01/08/1915 Age: 37 H. 31. United kingdom Rifleman 7542 London Regiment (Queen's Westminster Rifles) 08/04/1917 G. 61. United kingdom Lieutenant King's Own Yorkshire Light Infantry 19/03/1916 Age: 22 B. 9. United kingdom Private G/350 Royal Sussex Regiment 02/11/1916 F. 49. United kingdom Private 47254 Manchester Regiment 24/02/1917 Age: 20 F. 10. United kingdom Private 2743 The Loyal North Lancashire Regiment 01/07/1916 Age: 19 D. 5. United kingdom Private 18756 King's Shropshire Light Infantry 15/07/1916 Age: 21 D. 32. United kingdom Private 15840 Duke of Wellington's (West Riding Regiment) 27/07/1916 Age: 32 D. 19. United kingdom Lance Corporal 31838 Wiltshire Regiment 18/02/1917 Age: 19 F. 14. United kingdom Private G/41141 Royal Fusiliers 20/11/1916 E. 39. United kingdom Private 13991 East Yorkshire Regiment 12/05/1917 Age: 40 A. 39. United kingdom Sapper 197853 Royal Engineers 05/03/1917 Age: 31 E. 12. United kingdom Rifleman R/25072 King's Royal Rifle Corps 28/12/1916 Age: 22 F. 22. United kingdom Private 18746 West Yorkshire Regiment (Prince of Wales's Own) 05/08/1916 Age: 42 D 29. United kingdom Private 11510 King's Own Yorkshire Light Infantry 28/09/1916 E. 32. United kingdom Second Lieutenant Bedfordshire Regiment 18/03/1917 Age: 29 G. 9. United kingdom Private 11962 Durham Light Infantry 21/05/1916 C. 20. United kingdom Serjeant Royal Field Artillery 16/07/1916 Age: 34 D. 15. United kingdom Corporal 6071 London Regiment (Queen's Westminster Rifles) 08/04/1917 Age: 29 G. 55. United kingdom Rifleman R/21078 King's Royal Rifle Corps 29/01/1917 Age: 34 F. 16. United kingdom Lance Corporal 9949 Oxford and Bucks Light Infantry 04/07/1916 Age: 20 D. 36. United kingdom Corporal 8951 King's Own Yorkshire Light Infantry 28/09/1916 Age: 31 E. 31. United kingdom Private G/3493 Royal Fusiliers 11/09/1916 Age: 19 E. 40. United kingdom Rifleman S/7747 Rifle Brigade 13/10/1916 F. 40. United kingdom Corporal 5322 Rifle Brigade 25/05/1916 Age: 20 B. 19. United kingdom Private 3508 Durham Light Infantry 13/04/1917 H. 44/57. United kingdom Private 20366 Somerset Light Infantry 26/01/1917 E. 20. United kingdom Private 27417 Somerset Light Infantry 06/03/1917 Age: 41 E. 10. United kingdom Private 41838 Manchester Regiment 28/03/1917 Age: 19 D. 11. United kingdom Rifleman 7351 London Regiment (Queen's Westminster Rifles) 08/04/1917 G. 53. United kingdom Private 21/48088 The King's (Liverpool Regiment) 18/02/1917 E. 17. United kingdom Private 18772 Duke of Cornwall's Light Infantry 07/06/1916 C. 28. United kingdom Corporal 44219 Royal Field Artillery 16/05/1916 Age: 23 B. 14. United kingdom Private 3/9321 West Yorkshire Regiment (Prince of Wales's Own) 02/08/1916 Age: 18 D. 31. United kingdom Private G/60771 Royal Fusiliers 02/12/1916 Age: 27 F. 39. United kingdom Acting Bombardier 78362 Royal Garrison Artillery 06/04/1917 Age: 23 G. 40. United kingdom Lance Corporal 17688 The Loyal North Lancashire Regiment 28/04/1917 A. 36. United kingdom Rifleman 10165 King's Royal Rifle Corps 29/06/1916 C. 39. United kingdom Pioneer 128414 Royal Engineers 12/11/1916 F. 34. United kingdom Lance Corporal 29287 The King's (Liverpool Regiment) 14/03/1917 E. 7. United kingdom Private G/60722 Royal Fusiliers 27/10/1916 Age: 37 F. 41. United kingdom Private 4867 London Regiment (Royal Fusiliers) 30/03/1917 G. 24. United kingdom Gunner 1464 Machine Gun Corps (Motors) 07/06/1916 Age: 34 B. 27. United kingdom Rifleman R/15659 King's Royal Rifle Corps 02/06/1916 C. 25. United kingdom Private 5094 The King's (Liverpool Regiment) 01/07/1916 D. 4. United kingdom Private 6890 Yorkshire Regiment 25/07/1916 D. 23. United kingdom Private 27510 Somerset Light Infantry 26/01/1917 E. 22. United kingdom Private 3619 King's Own (Royal Lancaster Regiment) 08/07/1916 Age: 18 D. 7. United kingdom Gunner 87653 Royal Garrison Artillery 29/03/1917 Age: 30 G. 23. United kingdom Lance Corporal 10929 Duke of Cornwall's Light Infantry 03/03/1916 Age: 19 B. 6. United kingdom Rifleman 5670 London Regiment (Queen Victoria's Rifles) 11/04/1917 Age: 25 H. 62. United kingdom Captain London Regiment (Royal Fusiliers) 02/04/1917 Age: 21 G. 34. United kingdom Lance Corporal R/14430 King's Royal Rifle Corps 20/06/1916 C. 31. United kingdom Pioneer 129996 Royal Engineers 12/11/1916 Age: 18 F. 35. United kingdom Private 26043 The King's (Liverpool Regiment) 02/03/1917 E. 15. United kingdom Private 46384 Machine Gun Corps (Infantry) 27/11/1916 Age: 34 F. 31. United kingdom Private 2522 King's Own (Royal Lancaster Regiment) 09/07/1916 D. 9. United kingdom Private 26145 King's Shropshire Light Infantry 06/01/1917 Age: 24 F. 21. United kingdom Private 3/3103 King's Own Yorkshire Light Infantry 26/05/1916 Age: 28 B. 20. United kingdom Private 13611 Royal Irish Fusiliers 03/05/1917 Age: 28 H. 26. United kingdom Rifleman 5772 London Regiment (Queen's Westminster Rifles) 08/04/1917 G. 56. United kingdom Private 21733 Middlesex Regiment 15/11/1916 F. 33. United kingdom Private 5619 Somerset Light Infantry 05/03/1917 E. 13. United kingdom Rifleman S/13243 Rifle Brigade 13/10/1916 Age: 37 F. 38. United kingdom Private 18897 Somerset Light Infantry 11/05/1916 Age: 26 C. 5. United kingdom Second Lieutenant King's Shropshire Light Infantry 06/01/1917 Age: 19 F. 20. United kingdom Private 513206 London Regiment (London Scottish) 28/03/1917 Age: 21 G. 17. United kingdom Rifleman Y/1779 King's Royal Rifle Corps 29/01/1917 F. 18. United kingdom Private 325582 Durham Light Infantry 13/04/1917 H. 44/57. United kingdom Private 21563 West Yorkshire Regiment (Prince of Wales's Own) 01/08/1916 D. 31. United kingdom Rifleman 11628 King's Royal Rifle Corps 01/07/1916 Age: 22 C. 41. United kingdom Private 4/9960 Durham Light Infantry 18/03/1916 C. 6. United kingdom Private 21111 Bedfordshire Regiment 18/03/1917 G. 8. United kingdom Lance Corporal 15313 Duke of Wellington's (West Riding Regiment) 02/08/1916 Age: 20 D. 24. United kingdom Second Lieutenant Middlesex Regiment 09/04/1917 Age: 21 H. 2. United kingdom Private 262980 Middlesex Regiment 04/04/1917 G. 38. United kingdom Private 511959 London Regiment (London Scottish) 28/03/1917 Age: 20 G. 21. United kingdom Private (Signaller) 3268 King's Own (Royal Lancaster Regiment) 25/06/1916 Age: 19 B. 31. United kingdom Private 325581 Durham Light Infantry 13/04/1917 H. 44/57. United kingdom Private 43268 Suffolk Regiment 06/09/1916 Age: 18 F. 45. United kingdom Private 21337 Oxford and Bucks Light Infantry 08/07/1916 Age: 20 D. 35. United kingdom Corporal 513555 London Regiment (London Scottish) 28/03/1917 G. 12. United kingdom Private 11156 Yorkshire Regiment 21/07/1916 Age: 36 D. 20. United kingdom Lance Corporal Y/577 King's Royal Rifle Corps 25/06/1916 Age: 27 C. 36. United kingdom Rifleman 4256 London Regiment (Queen's Westminster Rifles) 08/04/1917 Age: 27 G. 54. United kingdom Second Lieutenant York and Lancaster Regiment 15/08/1916 C. 42. United kingdom Private 241630 Middlesex Regiment 01/04/1917 Age: 20 G. 30. United kingdom Private 26042 Durham Light Infantry 07/04/1916 Age: 22 C. 8. United kingdom Rifleman 12337 King's Royal Rifle Corps 20/06/1916 B. 30. United kingdom Private 43149 Suffolk Regiment 28/08/1916 Age: 23 F. 46. United kingdom Private 52811 The King's (Liverpool Regiment) 06/03/1917 Age: 20 F. 7. United kingdom Rifleman P/255 Rifle Brigade 07/03/1917 F. 51. United kingdom Lance Corporal 18067 Suffolk Regiment 18/11/1916 F. 42. United kingdom Private 513836 London Regiment (London Scottish) 28/03/1917 G. 13. United kingdom Private 3727 The King's (Liverpool Regiment) 01/07/1916 D. 3. United kingdom Rifleman R/12194 King's Royal Rifle Corps 10/01/1917 F. 19. United kingdom Private 25838 King's Own Yorkshire Light Infantry 17/05/1916 Age: 21 B. 16. United kingdom Private 47263 Manchester Regiment 23/02/1917 Age: 19 F. 11. United kingdom Private 325933 Durham Light Infantry 13/04/1917 Age: 20 H. 44/57. United kingdom Private 10232 Somerset Light Infantry 05/03/1917 E. 14. United kingdom Private 3207 King's Own (Royal Lancaster Regiment) 25/06/1916 Age: 21 C. 33. United kingdom Serjeant G/3384 Royal Fusiliers 13/04/1917 H. 42. United kingdom Private M2/149504 Army Service Corps 08/04/1917 Age: 23 G. 63. United kingdom Private 513396 London Regiment (London Scottish) 28/03/1917 Age: 20 G. 18. United kingdom Second Lieutenant Royal Engineers 08/04/1917 Age: 26 G. 46. United kingdom Second Lieutenant Durham Light Infantry 08/05/1916 Age: 22 C. 14. United kingdom Rifleman 390897 London Regiment (Queen Victoria's Rifles) 06/04/1917 Age: 23 G. 41. United kingdom Private 24214 Suffolk Regiment 21/08/1916 E. 44. United kingdom Private 26534 Somerset Light Infantry 09/02/1917 E. 18. United kingdom Rifleman A/2009 King's Royal Rifle Corps 29/06/1916 C. 38. United kingdom Sapper 139868 Royal Engineers 20/03/1917 E. 46. United kingdom Corporal S/13530 Rifle Brigade 25/05/1916 C. 21. United kingdom Private 15568 The King's (Liverpool Regiment) 22/02/1917 F. 12. United kingdom Private 19057 Yorkshire Regiment 30/07/1916 C. 34. United kingdom Rifleman R/8393 King's Royal Rifle Corps 29/06/1916 C. 40. United kingdom Private 21210 York and Lancaster Regiment 25/07/1916 D. 21. United kingdom Rifleman 2357 King's Royal Rifle Corps 20/07/1916 Age: 35 D. 14. United kingdom Private 512726 London Regiment (London Scottish) 28/03/1917 G. 19. United kingdom Rifleman S/5353 Rifle Brigade 11/05/1916 C. 18. United kingdom Serjeant 4978 Rifle Brigade 28/04/1916 Age: 22 C. 11. United kingdom Second Lieutenant Duke of Cornwall's Light Infantry 17/03/1916 B. 8. United kingdom Lance Corporal 12675 Norfolk Regiment 17/12/1916 Age: 21 F. 26. United kingdom Private 325836 Durham Light Infantry 13/04/1917 Age: 24 H. 44/57. United kingdom Rifleman S/10287 Rifle Brigade 27/05/1916 B. 21. United kingdom Rifleman R/14871 King's Royal Rifle Corps 22/06/1916 C. 32. United kingdom Private 15012 Duke of Cornwall's Light Infantry 29/04/1916 Age: 19 B. 3. United kingdom Private 26745 Wiltshire Regiment 11/03/1917 E. 5. United kingdom Private 21596 Somerset Light Infantry 26/01/1917 Age: 32 E. 23. United kingdom Private 19165 Duke of Cornwall's Light Infantry 18/06/1916 Age: 33 C. 30. United kingdom Private 43044 Norfolk Regiment 30/11/1916 Age: 22 F. 30. United kingdom Private 21314 Somerset Light Infantry 18/06/1916 B. 29. United kingdom Second Lieutenant Royal Garrison Artillery 09/04/1917 Age: 39 C. 43. United kingdom Corporal 4765 London Regiment (Queen's Westminster Rifles) 08/04/1917 G. 64. United kingdom Lance Corporal 40988 Northumberland Fusiliers 28/04/1917 Age: 26 A. 37. United kingdom Rifleman 302962 London Regiment (London Rifle Brigade) 07/04/1917 Age: 28 G. 58. United kingdom Rifleman A/1903 King's Royal Rifle Corps 21/05/1916 Age: 19 B. 18. United kingdom Rifleman S/13659 Rifle Brigade 08/05/1916 C. 12. United kingdom Rifleman 7520 London Regiment (Queen's Westminster Rifles) 08/04/1917 G. 50. United kingdom Rifleman 1785 London Regiment (Queen Victoria's Rifles) 08/04/1917 G. 45. United kingdom Private 16265 Somerset Light Infantry 02/03/1916 Age: 21 C. 3. United kingdom Private 20610 York and Lancaster Regiment 21/07/1916 Age: 20 D. 18. United kingdom Private 12141 South Staffordshire Regiment 27/07/1916 Age: 20 D. 27. United kingdom Rifleman 300282 London Regiment (London Rifle Brigade) 07/04/1917 Age: 27 G. 44. United kingdom Corporal 43225 Royal Scots 28/04/1917 Age: 23 C. 46. United kingdom Private G/11392 Royal Sussex Regiment 12/09/1916 Age: 22 E. 45. United kingdom Private 32750 The King's (Liverpool Regiment) 11/03/1917 Age: 21 E. 6. United kingdom Private 325822 Durham Light Infantry 13/04/1917 Age: 20 H. 44/57. United kingdom Private 512712 London Regiment (London Scottish) 28/03/1917 Age: 20 G. 20. United kingdom Captain Somerset Light Infantry 19/03/1916 Age: 40 C. 4. United kingdom Bombardier 14478 Royal Horse Artillery 06/06/1917 B. 35. United kingdom Private 36759 The King's (Liverpool Regiment) 14/03/1917 E. 9. United kingdom Gunner 940262 Royal Field Artillery 05/04/1917 Age: 23 G. 36. United kingdom Rifleman A/398 King's Royal Rifle Corps 10/06/1916 Age: 20 B. 28. United kingdom Rifleman 12428 King's Royal Rifle Corps 27/06/1916 Age: 19 B. 32. United kingdom Private 325970 Durham Light Infantry 13/04/1917 Age: 23 H. 44/57. United kingdom Gunner 66130 Royal Garrison Artillery 06/05/1916 Age: 26 B. 11. United kingdom Private 22997 Middlesex Regiment 23/11/1916 E. 27. United kingdom Gunner 68593 Royal Field Artillery 07/04/1917 Age: 25 G. 65. United kingdom Private 12138 King's Own Yorkshire Light Infantry 24/04/1916 Age: 24 B. 10. United kingdom Private 25686 King's Own Yorkshire Light Infantry 31/05/1916 Age: 17 B. 23. United kingdom Lance Corporal 2641 London Regiment (Royal Fusiliers) 02/04/1917 Age: 23 G. 35. United kingdom Private 250 The Loyal North Lancashire Regiment 29/06/1916 D. 2. United kingdom Rifleman 393627 London Regiment (Queen Victoria's Rifles) 06/04/1917 Age: 23 G. 42. United kingdom Private 40526 Norfolk Regiment 21/11/1916 Age: 19 F. 32. United kingdom Rifleman Y/1535 King's Royal Rifle Corps 27/06/1916 Age: 19 B. 33. United kingdom Private 23840 Oxford and Bucks Light Infantry 31/12/1916 Age: 20 E. 26.